1. Place the beetroot, chick peas, 2 of the crushed garlic cloves, flour, cumin, chilli flakes and sea salt in a food processor and blitz to a rough paste. 2. Using wet hands roll into about 16 walnut-sized balls (falafel) and chill until ready to cook. 3. Steep the onions in the lemon juice and leave for about 20 minutes to draw out the colour and soften the flavour. 4. Add 1 tbsp olive oil to a pan and gently fry half the falafel for 5 minutes turning frequently until crisp on each side. Remove and keep warm in the oven while the other batch is fried. 5. Mix the tahini with the yogurt and remaining crushed garlic. 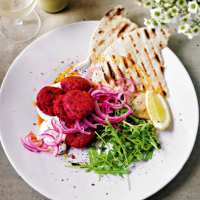 Serve the falafel with the red onions and tahini sauce with pea shoots and flatbreads on the side and a little chilli oil drizzled over.